Data is everywhere. It can be hard to make sense of it all. streamline your process and impress your buyer. category management, and supply chain teams. Many retailers are no longer expanding their brick and mortar locations like they had in years past. We can no longer rely on store expansion to grow item sales. Same store sales are more important than ever. Retailers are looking for partners who can bring them product performance insights to grow categories and drive traffic to current stores. Visualizations are an invaluable complement to grid-based reporting. 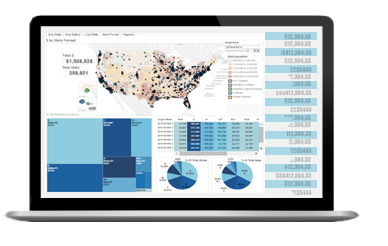 We have partnered with Tableau - the leading data visualization company in the US. Our industry experience combined with powerful third-party partnerships allows for visualizations that were previously impossible to render. • Quickly access your product performance across the entire chain or multiple retailers. • Reports are pre-built for your team, and updated automatically each week with the most current data. • Exception reporting allows you to quickly spot trends. • Change the time period to match your transition date. • Only subscribe to reports when a condition is met, such as a sales increase of +/- 10% versus the previous week. • Receive reports only when inventory level drops your weeks of supply below a certain threshold. Find the data that matters. Sales are up, but why? Attach attributes to your retail locations to get the full picture. Test your promotions across different stores to compare incremental dollars and units per store. Consistent collection of retail data is a weekly battle for many organizations. We collect sales and inventory information from both EDI 852 files or reports available on the retailer's vendor portal. We have 5700 trading relationships between more than 900 trading partners and manage data for over 700 active vendors at Target. Why make huge commitments of time and money? We can work in parallel with your existing system. Our low-cost, low-commitment approach makes for either a convenient supplement to, or smooth transition from, your current system. Customize YOUR reports. Display the data YOU want to highlight on reports bearing YOUR brand and logo. Match your corporate colors. Build custom dashboards from scratch. Standard reports and those you build on your own can be saved and shared within our hosted environment and shared with others on your team. Product maintenance can be time consuming. Roll into the office Monday morning with valuable insights waiting for you. Put in as much, or as little, effort as you like. We handle the rest. SetSight Viz can be run with no ongoing product maintenance. you have that option as well. Our servers and databases are 100% in the cloud, utilizing Amazon Web Services and Microsoft Azure to make sure your data is up and running even when we're at home sleeping. Along with minimal downtime, this also provides added security and the ability to scale up and add servers at a moment's notice. No job is too big for us; we can grow quickly. SetSight is not an all-or-nothing solution; clients can start with any individual services they want, then add as needed, allowing for an ala carte solution. SetSight is a true turnkey solution. Our setup process is so efficient, you will receive useful visualizations within two weeks of signing up. There is no need to cancel other services or engage in lengthy transition procedures. Sign up, let us add to your retail portfolio, and scale up as needed. Discuss your needs with our sales staff today.